How long has Cell Dogs been in the business of training dogs? We started working with shelter dogs and correctional institutions in 2007 and have since implemented six programs at institutions serving either incarcerated adults or minors. Some members of our organization have been training dogs for over 25 years. Collectively, we have 100+ years of training experience. How are dogs selected for the program? Shelter dogs are evaluated and temperament tested before they are chosen as program participants. We select dogs of all ages, sizes, shapes, and colors once they are deemed appropriate to get along with other dogs in that training cycle. It is not necessary for the dogs to have any prior training. In fact, most of our program dogs have had little or no previous training when we first meet them at the shelter. How long before a dog is placed with an adoptive family? Our basic obedience program involves 8–10 weeks of training, and the dogs are adopted when they complete that program. Training a service dog involves a minimum of 9–12 months, which includes basic and advanced training programs. They are placed when they pass the Public Access Test. How do you review adoption applications? We will call to chat with you about the dog you have selected. We want to ensure that everyone’s personalities and energy levels are compatible. In taking the time to discuss your needs, we do our best to match you with a dog that will make you happy. We have successfully adopted hundreds of dogs to individuals with all types of housing and lifestyle arrangements. What requirements does the adopter need to meet? We ask potential adopters to come meet their prospective “fur-ever” friend at our training location. If this meet-and-greet is successful, we request a 50% deposit to hold that dog specifically for you until the dog graduates from the program. I’ve adopted a Cell Dog and need some guidance with training. Will you help? Every Cell Dogs graduate is crate and potty-trained, knows all basic commands, and has a few cute tricks to show off. Since each adoption is a new beginning for all involved, some people may desire help after the dog has settled in at home. You can reach us at info@celldogs.org or (714) 747-6782 for a free consultation. If you need further assistance regarding one of our graduates (or non-graduates), we offer individual training sessions for a separate fee. We can also board your dog to address any issues. For these services, please contact our trainer Anna at anna@celldogs.org. What types of services are the dogs trained to provide? We currently train service dogs for children with autism spectrum disorder (ASD), individuals with post-traumatic stress disorder (PTSD), and individuals with physical disabilities. Will Cell Dogs train my own dog to be a service dog? What about dogs for emotional support? 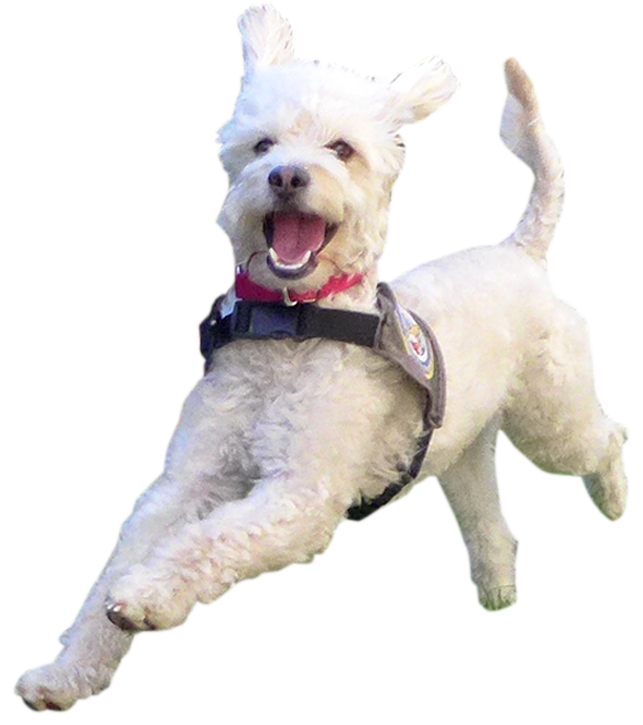 We do not currently train or certify non-program dogs to become service dogs. The same applies for emotional support dogs. However, we can offer personal training sessions for a separate fee with one of our trainers. For a child with autism, what is the right age to bring a service dog into their life? Our years of experience have taught us that it’s best to work with a child that is at least 8 years old. What is the cost for a pet or a service dog, and what does it include? The requested donation for one of our trained shelter dogs is $500. This fee includes all program supplies and materials, as well as shelter and instructor fees. When the dogs graduate from our program, they are fully vaccinated, spayed or neutered, dewormed, have a microchip plus monthly flea medication, are crate and potty-trained, and know all their basic obedience commands along with a few cute tricks. The requested donation for a fully trained service dog is $7,500. This fee includes the training expenses associated with the basic obedience program as well as our service dog training program. Once a proper client has been identified for a service dog, they must participate in a two-week Partnership Training Program, which involves personalized training with their service dog-in-training. The goal of Partnership Training is to certify you and your dog for public access. We offer scholarship opportunities for eligible clients. I do not live in Southern California. Do you help with travel accommodations for Partnership Training? Unfortunately, we do not provide reimbursement for your travel or hotel accommodations during service dog training.